* Various other small usability fixes. Also note that this is the last release that will support both PHP4 and PHP5. All future releases will only support PHP5 and higher versions. 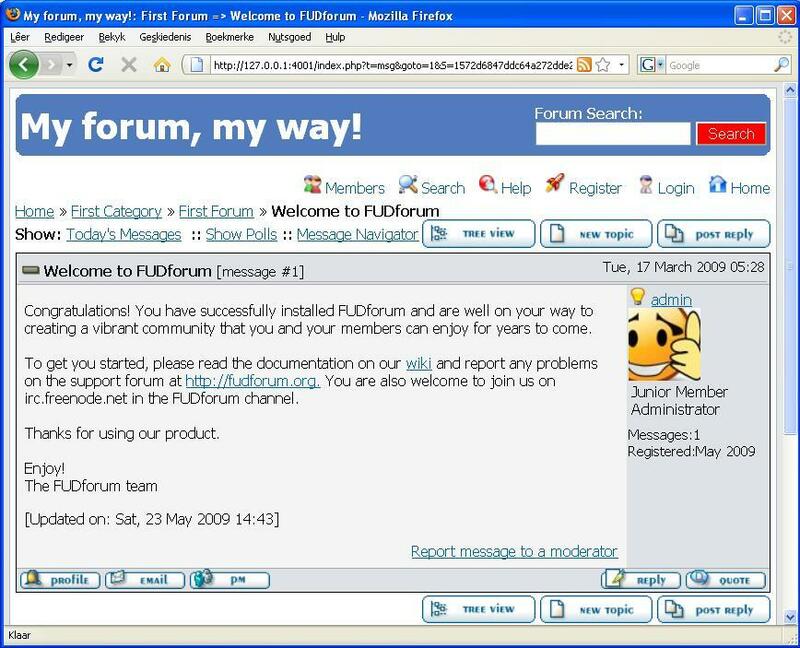 If you haven't upgraded your forum to FUDforum 2.8.x yet, we highly recommend you do so right now! Upgrade went very smoothly; FUDforum's getting easier to use with each successive upgrade. Excellent work! Downloading seems to be broken. The server was moved to a new host and everything is not yet sorted out. I trust it will be fixed soon. The downloads are available again. Only issue I can see is now the default theme puts a large bar across the top with a search field. I'd prefer not to have this. Is it easily editable somewhere, or an option to turn off the field? You can edit the header template to remove it. Hi Frank - I'm probably asking out of ignorance here, but for the sake of those who merely want to *modify* the existing header/footer, but whose skills end at basic HTML - can the header and footer be *commented* internally so the uninitiated know what modifying or deleting a particular section of them does, and where to, say, paste basic HTML inside them? I guess we can add comments, it will make editing easier. On the downside, it will produce larger pages, consume more bandwidth and make the forum slower. It's certainly a flip of a coin, with pluses and minuses - greater user-friendliness vs greater efficiency. Perhaps a compromise might be (minimally) commenting only the most-commonly modified files like header/footer? Or if that will still have too much impact, perhaps it's better to just make a Wiki page with the sections of those files explained? There is a lot of merit to this idea. I have used comments in my headers and CSS since I found out what they were, but have been less than satisfied with the result (other than that it is a simple way to annotate some notes for reference sake). Other methods of annotating what each variable or section does, or applies to such as THIS "biggest hammer approach" have not worked to my satisfaction either. And unfortunately none of the word processors tried seem to have the functionality to easily remove various comments with out retyping each one, so kerryg's suggestion for a Wiki entry with such comments appeals to me a lot! Naudefj has already made great strides in improving the usability and user friendly aspects of fudforum and available documentation and it looks like it will only get better from here on so I am not seeing a downside here.